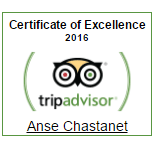 Here at Anse Chastanet we are committed to providing you with the most memorable St. Lucia vacation experience possible. 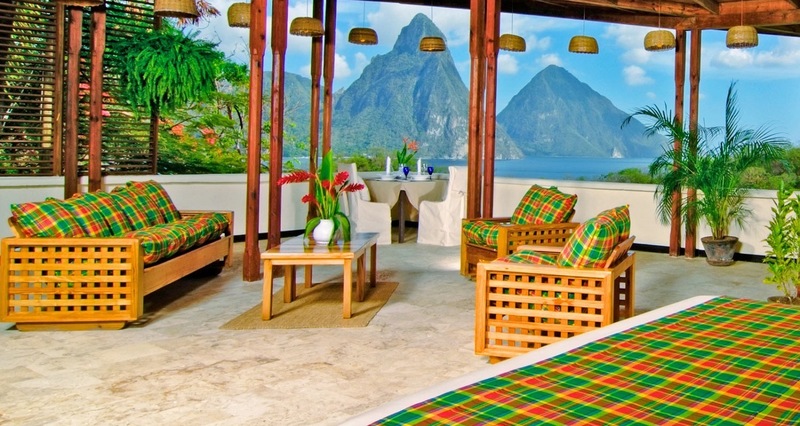 The hospitality of our St Lucia resort team is legendary. 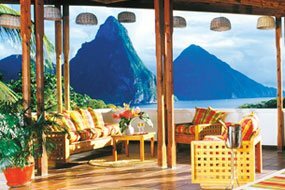 Anse Chastanet is scenically one of the most spectacular beach resorts in St. Lucia and the ideal St Lucia vacation destination whether you are planning a St Lucia honeymoon, St. Lucia wedding, a St Lucia diving vacation or simply a St.Lucia hideaway experience. 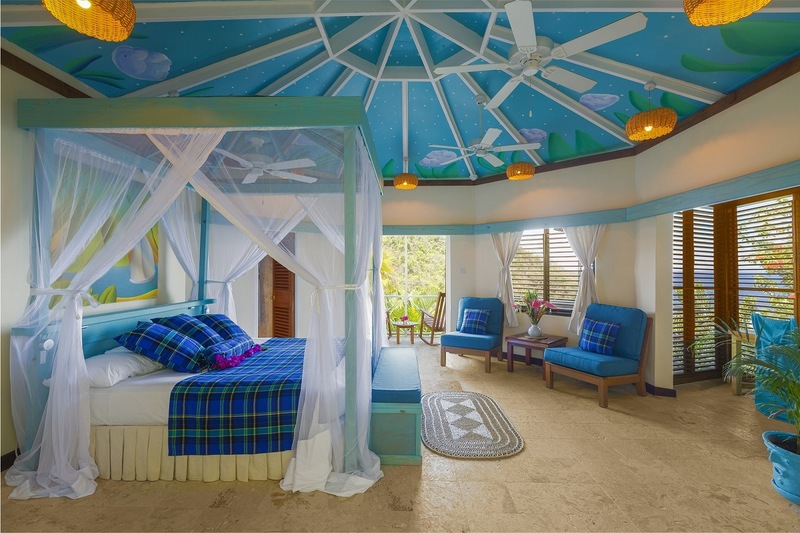 ANSE CHASTANET offers 49 individually designed rooms, 37 of which are scattered about a lush hillside, and 12 which are nestled within a tropical garden at beach level. 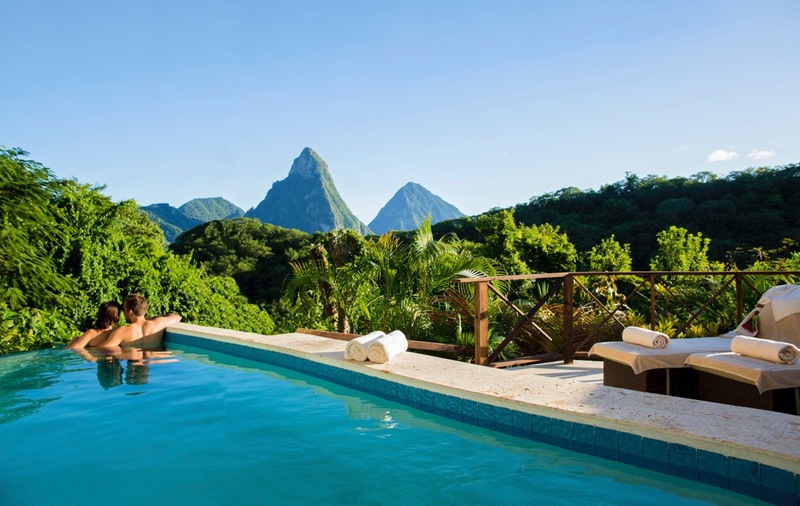 Anse Chastanet’s Premium rooms offer picture postcard perfect views of the St.Lucia’s Pitons – a Unesco World Heritage site- and the surrounding Caribbean Sea by virtue of their location on the higher hillside level. 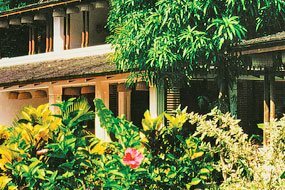 Some Premium rooms have the fourth wall missing entirely, whilst others have wooden louvre walls which open to balconies/patios. 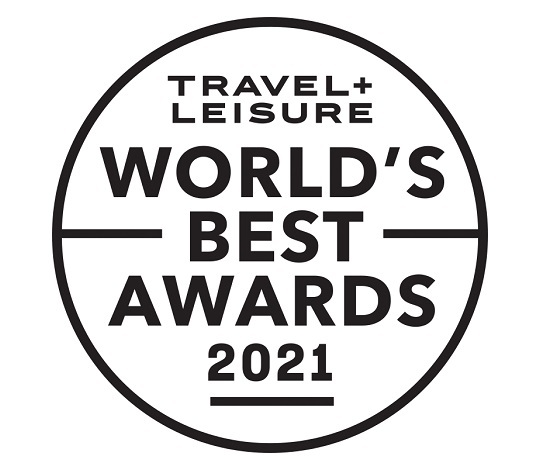 In room amenities include fridge, tea/coffee/espresso makers, in-room electronic safes, hand made bathrobes, slippers, hair dryer, Molton Brown amenities, free WiFi, twice daily housekeeping service with complimentary bottled water. 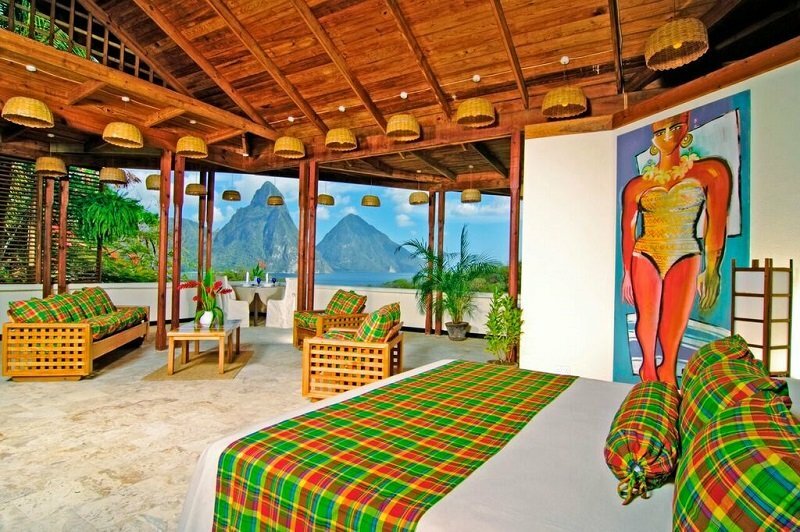 The spacious hillside deluxe rooms are located at various hillside levels with beautiful views of the Caribbean Sea and/or St.Lucia’s Pitons. 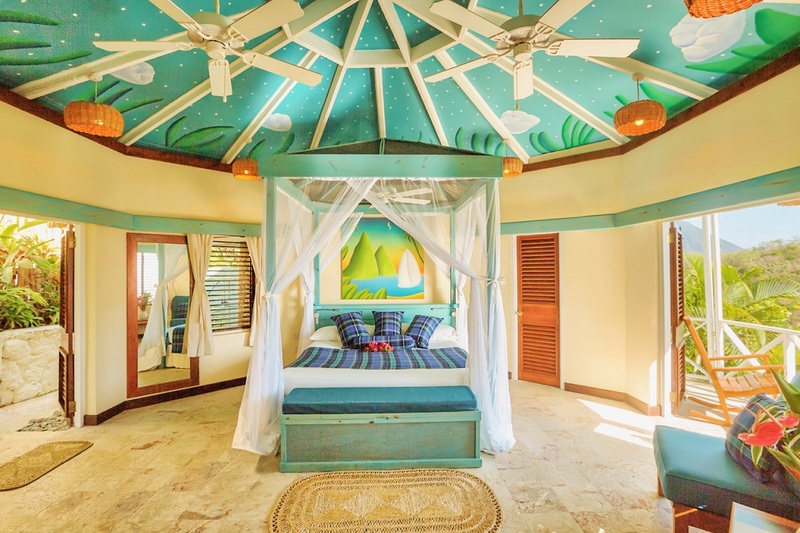 Some hillside deluxe rooms have the fourth wall missing entirely whilst others have wooden louvre walls and open room dormers allowing for excellent natural airflow. 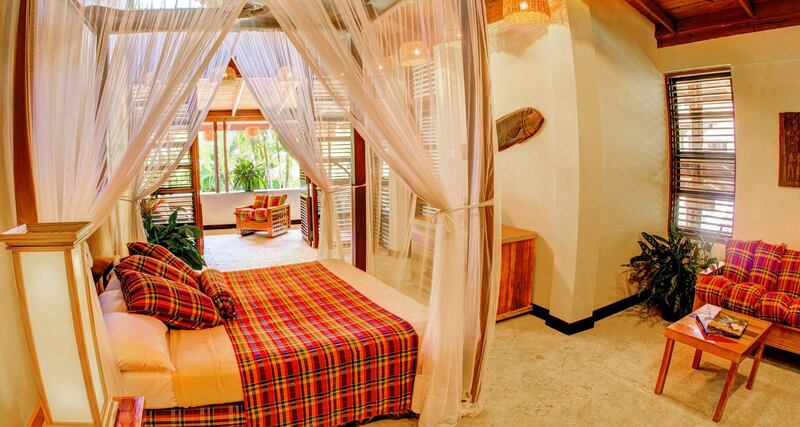 All rooms have kingsize beds, ensuite bathrooms with 2 sinks, shower and toilet. Upon request, extra bed or twin beds can be provided. 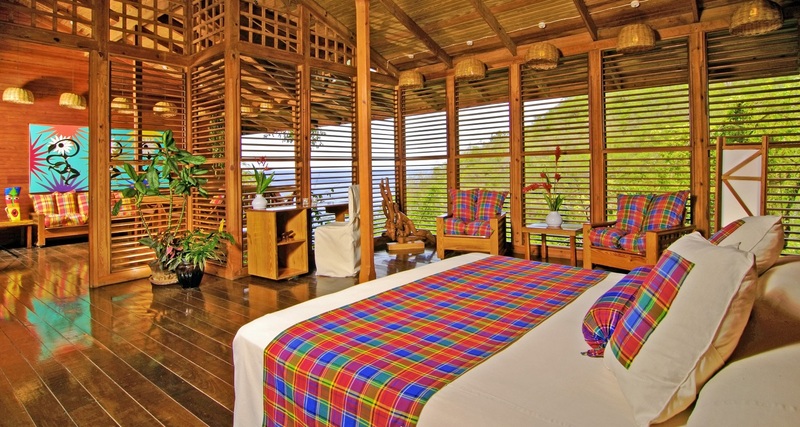 All of Anse Chastanet's beachside rooms are deluxe category rooms. 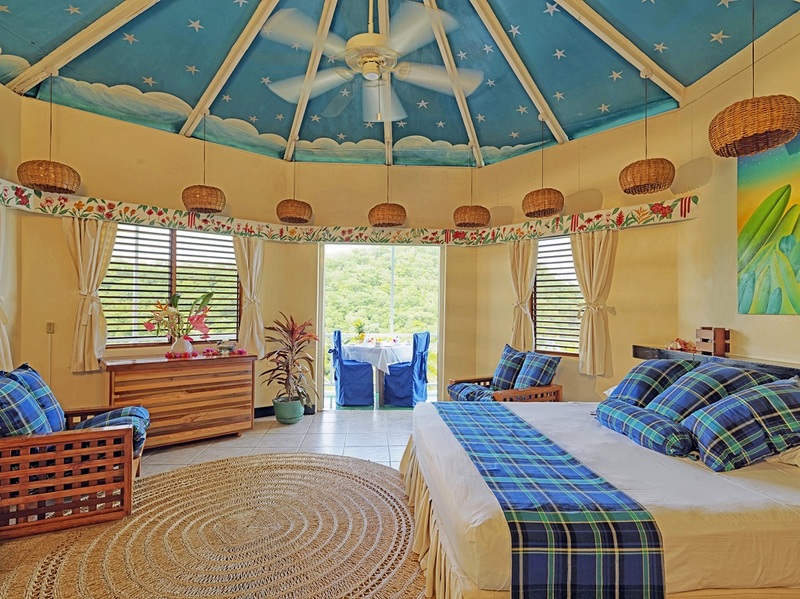 The beachside deluxe rooms are generous in space, with coralina or clay tiles and wooden jalousie louvre windows and large balconies or patios. 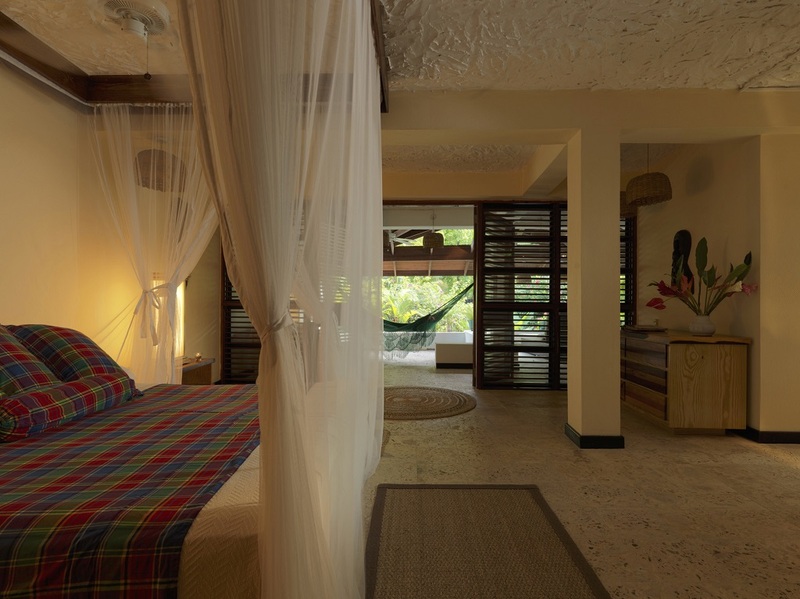 All beachside rooms offer a tropical garden view and are just a few feet away from the beach and water's edge. 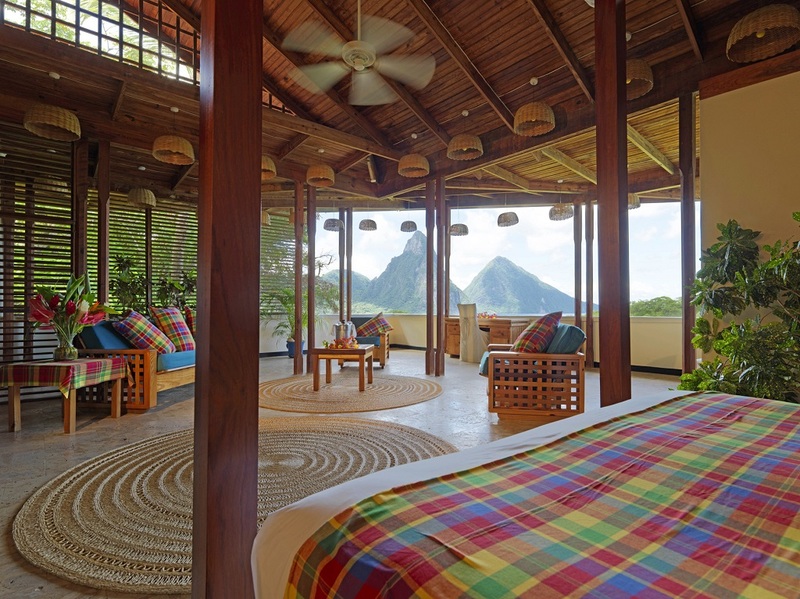 Anse Chastanet’s Superior rooms are located at various levels on the hillside and they are octagonal or rectangular in shape. 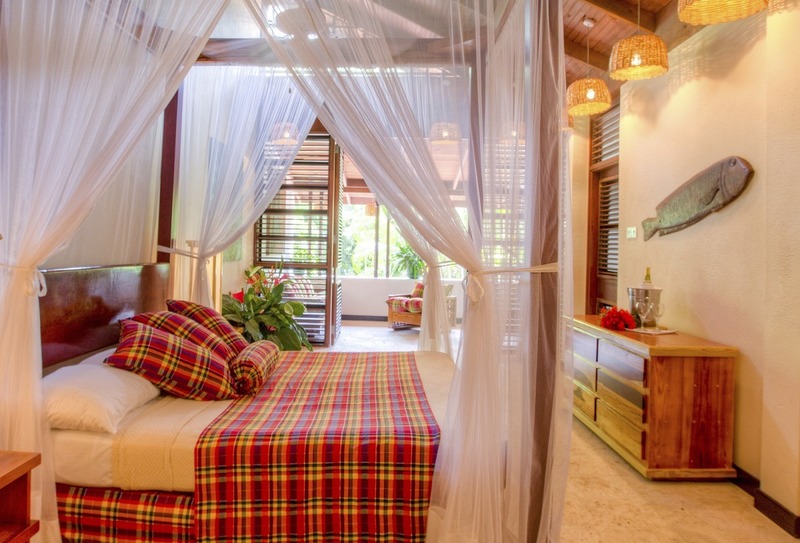 All rooms have kingsize beds, ensuite bathrooms with sink, shower and toilet. Upon request, extra bed or twin beds can be provided. 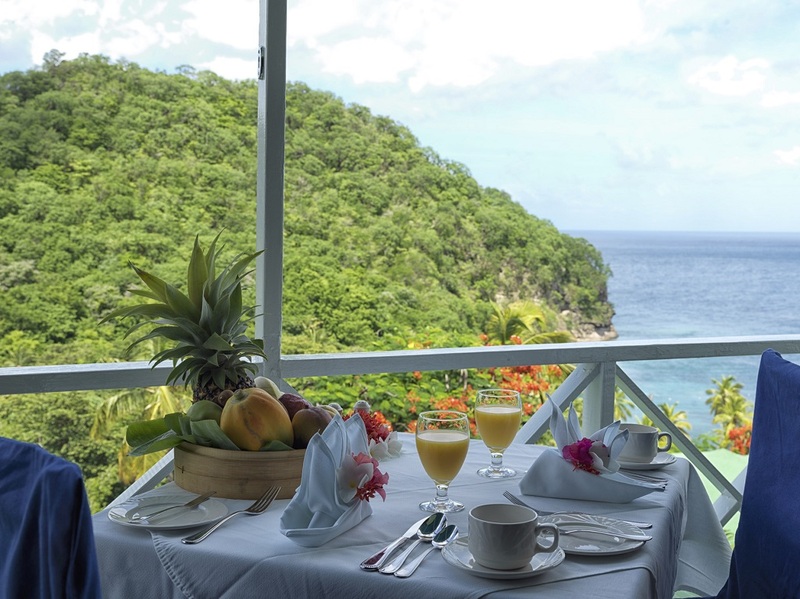 When booking standard category, please know you could be located on either hillside or beachside - the category is based on "run of house" principle which may lead to a complimentary upgrade to superior or beachside deluxe location, at the Resort's discretion but never guaranteed. 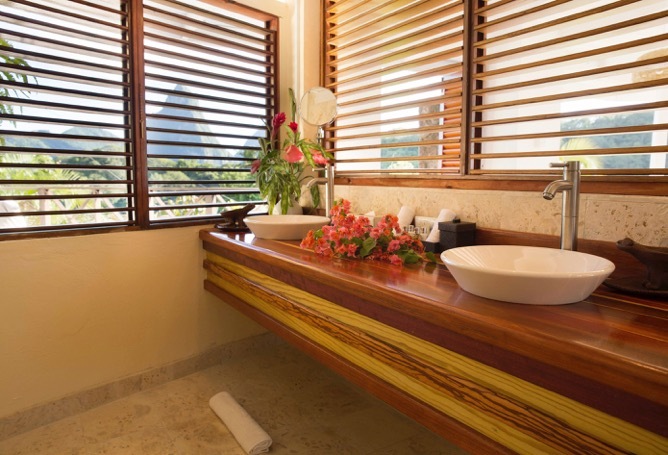 Upon request, the suite can be connected to a second room, creating an inter-connecting two bedroom two bathroom suite. 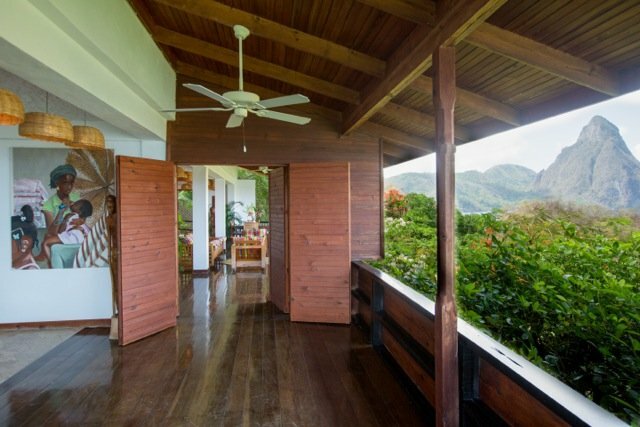 The Beach House at Anse Chastanet is located on the north corner of Anse Chastanet beach where you can sit and relax, looking out over the sparkling Caribbean Sea, watching sunsets year round from your elevated brick deck in the landscaped oceanfront garden. 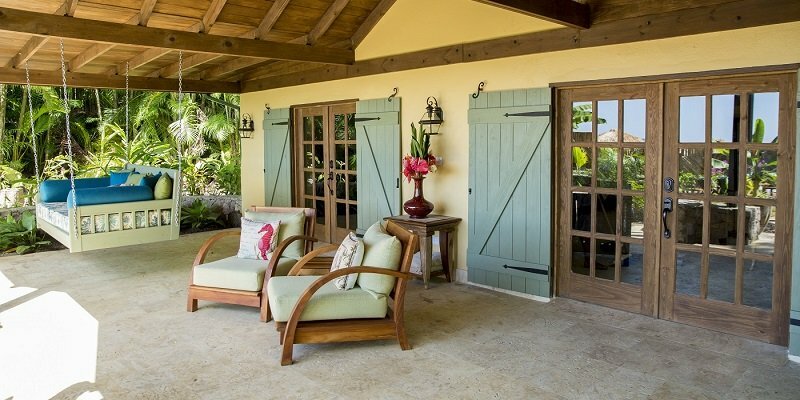 The interior is bright and airy, bathed in warm Caribbean sunlight shining through its French doors and windows. 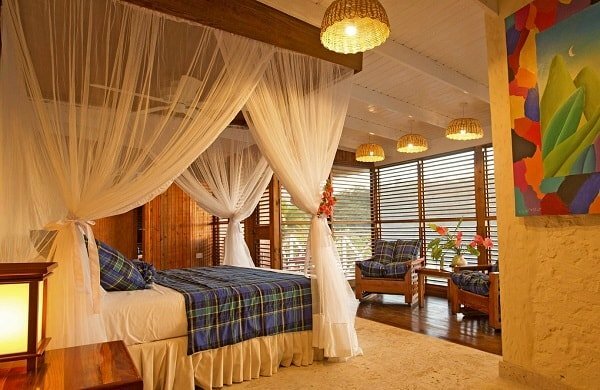 The interior decor of the Beach House is a celebration of Saint Lucia’s heritage which saw the island change hands between the French and the British 14 times. From the beach level next to the flower garden, you walk up a few hand-hewn stone steps, across your personal stone-column, gated bridge, onto the brick pathway, with its wind sculpture and antique sundial, leading to your spacious 450 square foot covered patio (1600 sq ft total). 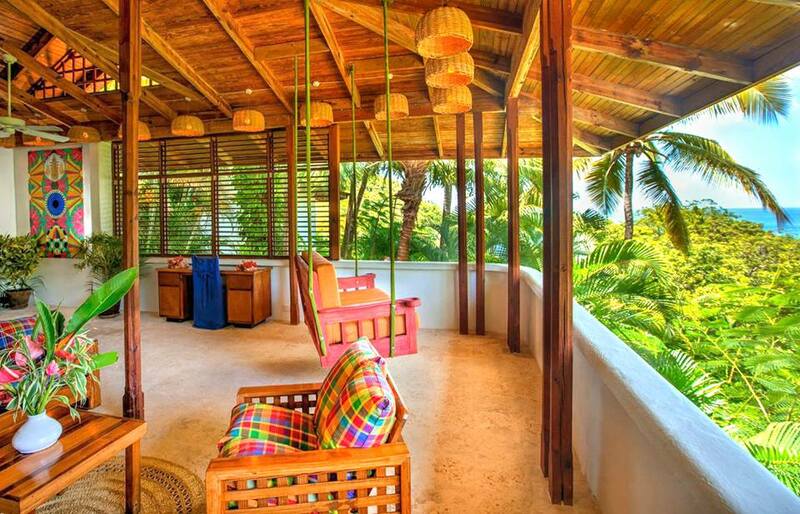 To rinse off sea salt and sand, simply dip under the outdoor shower adjacent to the brick pathway. The covered patio has a garden and roses on one side and an herb garden, flowers and a water feature on the other. The expansive bathroom off the main living area features two large, rectangular white porcelain pedestal sinks with inset mirrors and glass wall sconces. A large, open custom rose glass tile shower area provides you with two rain showers, bench and an additional hand held shower. 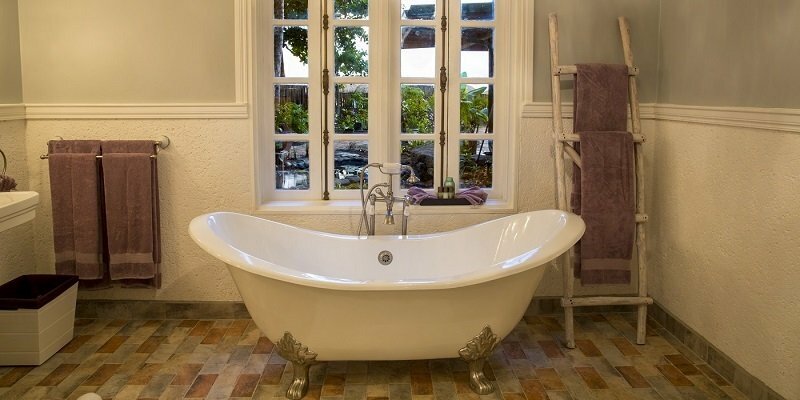 A cast-iron clawfoot slipper tub is set in front of a garden window with a view of the unique water fountain and pond, with water lilies and Koi fish. 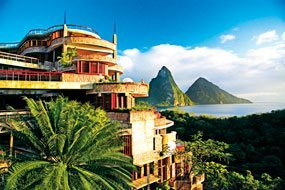 Located high on Morne Chastanet, overlooking the Pitons and Caribbean Sea, JADE MOUNTAIN is a resort within a resort at ANSE CHASTANET. 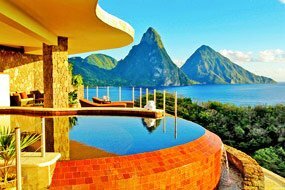 Expect grand sweeping spaces, with your sleeping and living areas and an extravagantly sized infinity edge pool - one in each sanctuary!- flowing into one another to form an amazing floating platform with the 4th wall missing entirely - the result being a stage-like setting from which to embrace the full glory of St. Lucia's twin Pitons and the shimmering Caribbean Sea - a view you are not likely to ever forget. 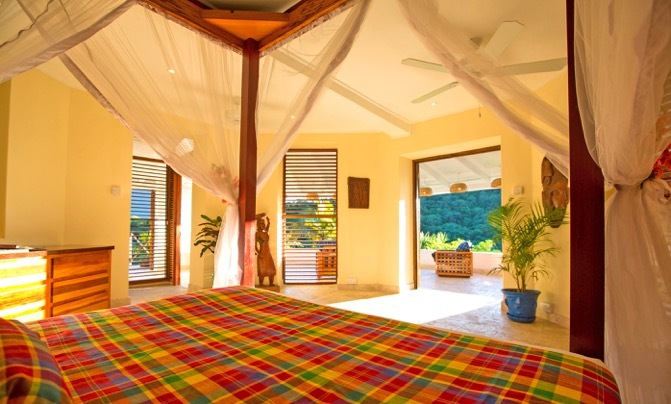 ANSE CHASTANET offers a few selected two bedroom 2 bathroom suites which are available on request. 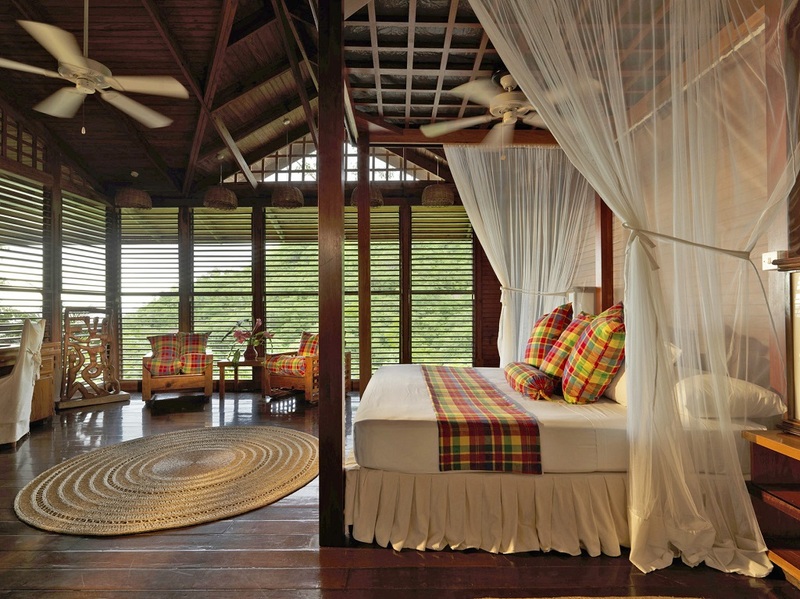 Suite/room combinations are available in Standard/Superior, Deluxe Hillside and Premium Categories. 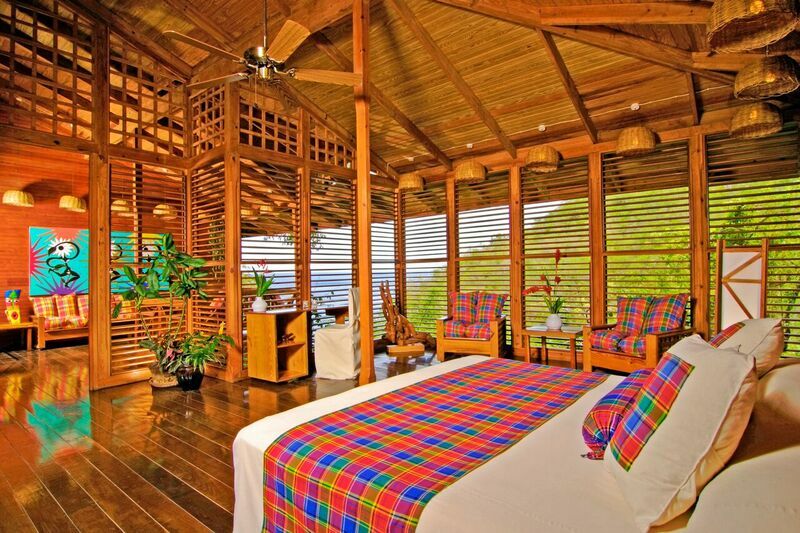 ANSE CHASTANET emphasizes the use of local woods and other local products in the room decor and furnishings. 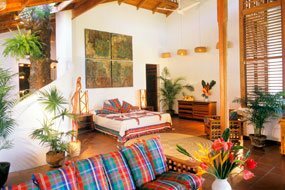 Cushions and bedspreads are made from colorful cotton fabrics called madras, the island's "national cloth." Even the resort bathrobes are locally made and have become a popular souvenir item! 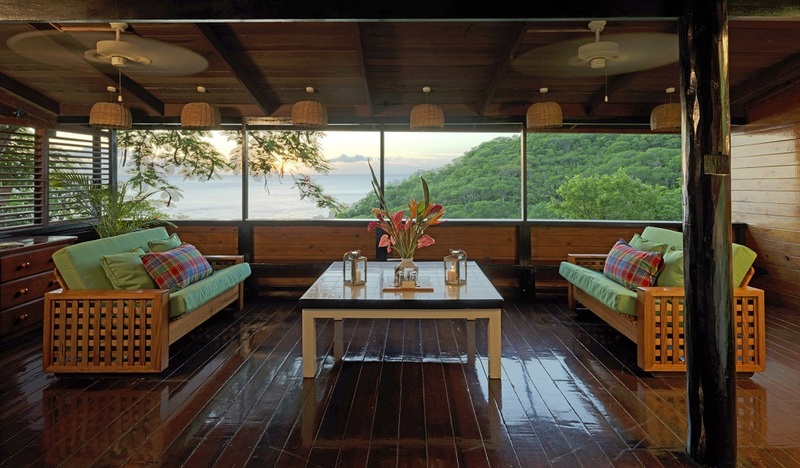 The furniture has been individually designed and handmade in the region with the exclusive use of the island woods such as teak, mahogany, green heart, red cedar and wild breadfruit. 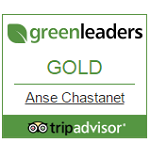 All rooms have fridges, electric tea/coffee makers and wall mounted hair dryers, and in-room safes. 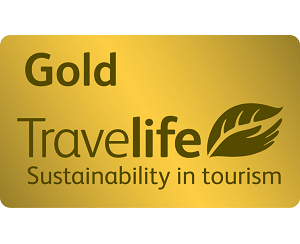 Deluxe and Premium rooms also have irons and ironing boards. 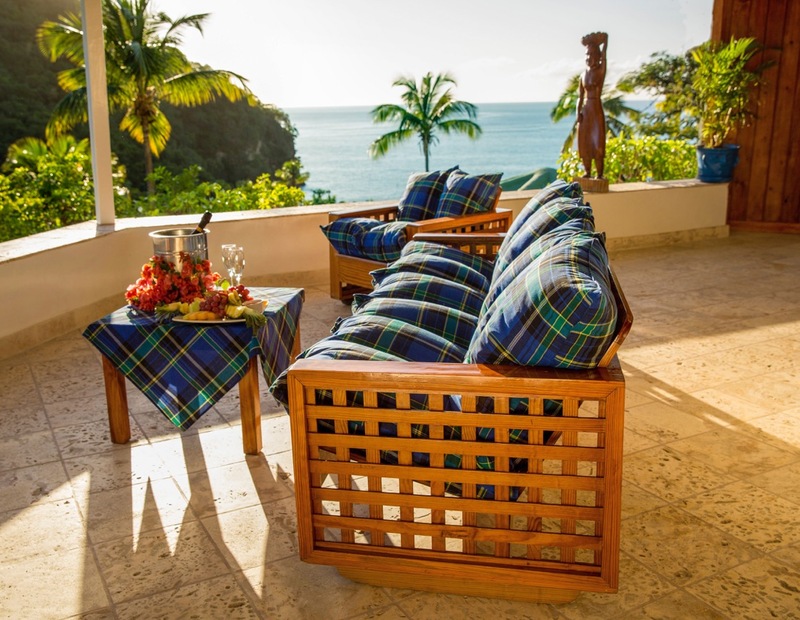 Please note that there are approximately 100 stairs leading from beach level to mid-hillside level, thus making the property unsuitable for those with walking difficulties or cardiac problems. This is never a question of age. 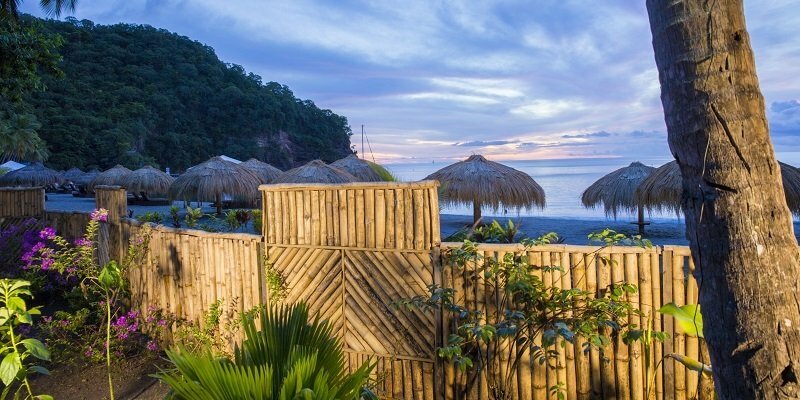 A complimentary shuttle service from beachside to hillside level is provided any time it is requested. 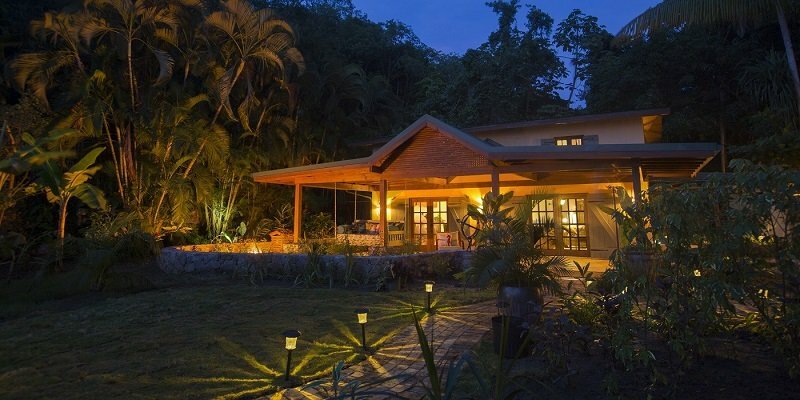 Facilities at our 600 acre resort include two soft sand beaches, 12 miles of jungle biking, walking and hiking trails in the Anse Mamin valley with excellent birdwatching options, 3 restaurant locations serving a variety of menus including modern Caribbbean, East India-St.Lucia fusion and vegetarian. 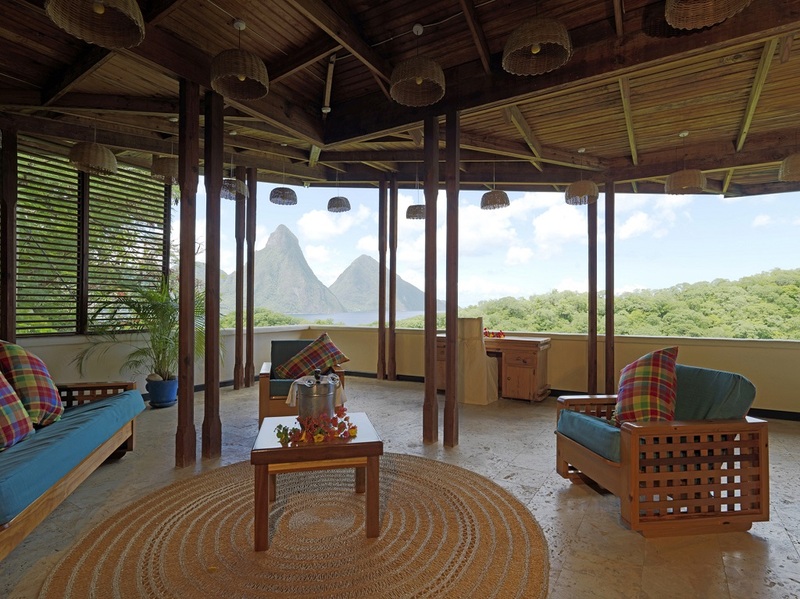 There are 2 bars plus the Jungle Grill and Bar at Anse Mamin, an excursions and car rental desk, 2 beachside boutiques and art gallery, the Kai Belte Spa, Scuba St. Lucia, a watersports center with complimentary snorkeling gear, windsurfers, sunfish sailboats, paddleboards, Bike St. Lucia with bike rental, Kayak St. Lucia with complimentary sit on top kayaks and Prijon kayaks at a rental fee. 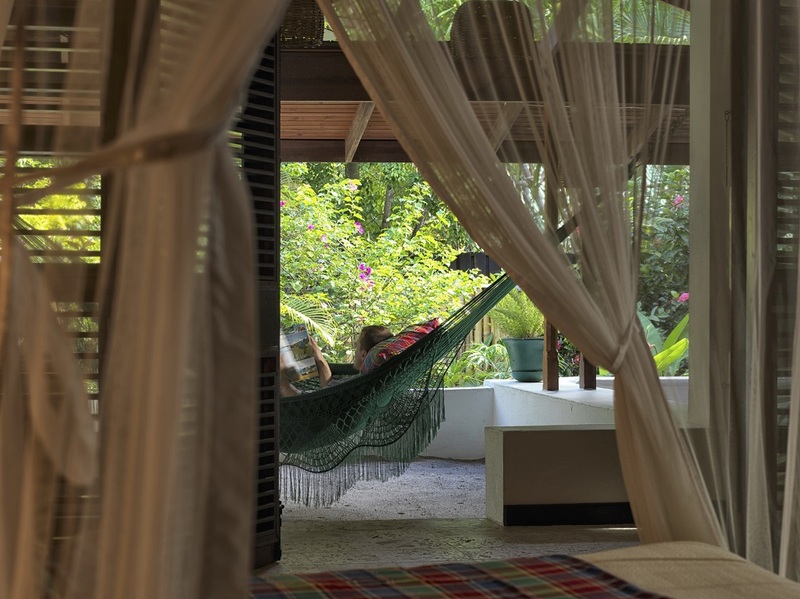 There is wi-fi available in our rooms and also, near our reception area and there are also computers for guest usage.